“How about cake? Everybody loves cake!” My husband says that in his best Donkey (Eddie Murphy in Shrek) voice anytime I say I’m hungry and I don’t know what I want. He makes me laugh…and he makes me hungry for cake! I rounded up 12 delicious cake recipes from you guys and the hosts this week, hopefully you’ll find something to curb your cake cravings! Hello there! Tiffany here again from Making the World Cuter! 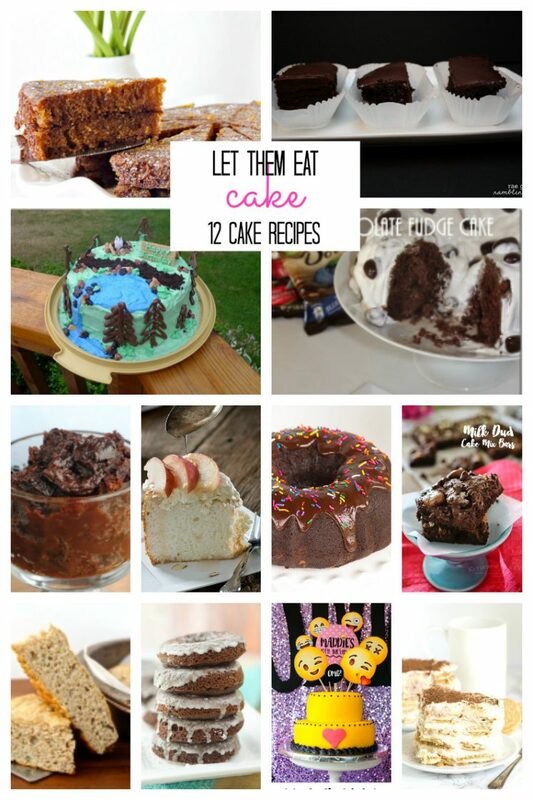 School is just about to start back up and I feel like I haven’t had summer yet, so I could definitely use one or more these cake recipes about now! That, and three more months of summer! Ha! Happy to be hosting today and getting to see all of your fun ideas along with my friends Marissa, Kaysi and Polly! Thank you for featuring my lava cake recipe this week! Thank you so much Tiffany and Marissa for featuring our homemade angel food cake recipe!